I know, we’re not supposed to eat food out of a box, but let’s be realistic: We’re busy, we’re tired, we’re hungry, and if we can understand the ingredients on the back, well, I say go for it–but be as healthy about it as you can. That’s why Kohinoor has become my go-to Indian food-in-a-box when I’m at the local supermarket craving a touch of spice. Kohinoor Tempting Lentils with Spinach, and Rice Treat Steamed Basmati Rice. Both are 100% vegetarian. Both take about four minutes on the stove, less if you’re using a microwave. Both are amazingly delicious for something unleashed from a box. The lentils and spinach have a slightly peppy, mild spiciness that warms rather than fries your tastebuds with ginger, garlic, cumin, garam masala and turmeric powder among the ingredients. Yes, you may have to help it ooze out of the bag but it’s so good once it’s cooked. The steamed basmati rice is a lovely way to get your favorite rice where it belongs, fast: In your innards! 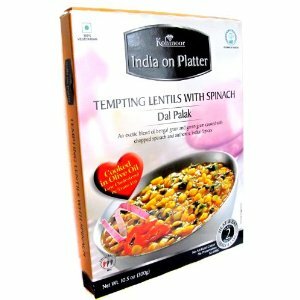 Using just water, basmati rice, refined sunflower oil and salt, this ready-to-go dish is gluten free and cholesterol free, and a perfect complement to the lentils & spinach. Kohinoor is worth a trip to your grocery store when you can’t get to an Indian restaurant. Go for it! ← Does my (walking) trail end here?